Manga is black and white series of comics books which made in Japan and are popular all over the world. Manga has different names in different countries but the name Manga is especially driven by the founder of it named Osamu Tezuka. Anime which is a popular term around the world has also driven by Japanese comics and even some popular series of anime has created from the manga. Manga is available in different languages and since it is popular around the world so people do like to read it on the internet. Because basically, the Manga is a printed comic book but the expansion and the availability of things on the internet make people run queries like read manga online. Surely there are a lot of websites which provides Manga online. Most of them provide Manga for some reasonable price but still, there are sites which provide free manga online. Here we have listed only those free sites which you can use to read and enjoy manga for free. Manga online is a hub of Mangas, where you will get the list of all latest manga. On home page you will get all the Hot manga updates. 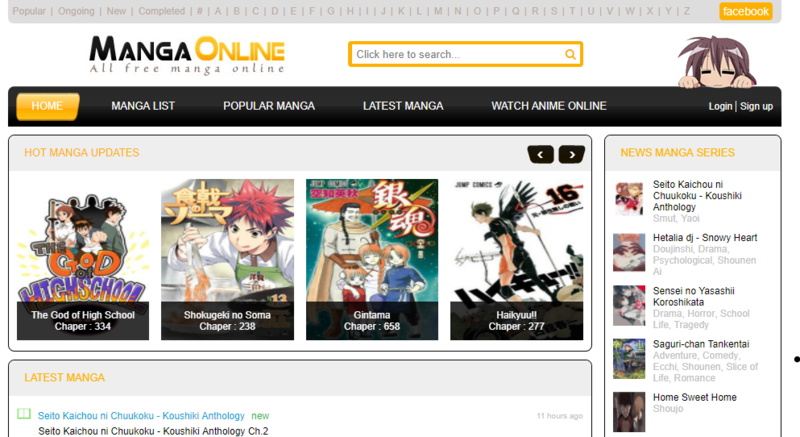 You can use Header menu to check Popular, New, Ongoing, and complete series of manga. Also, reading manga with the alphabatical manner is easy here, simply select any alphabet you will get the list of all manga related to that alphabet. 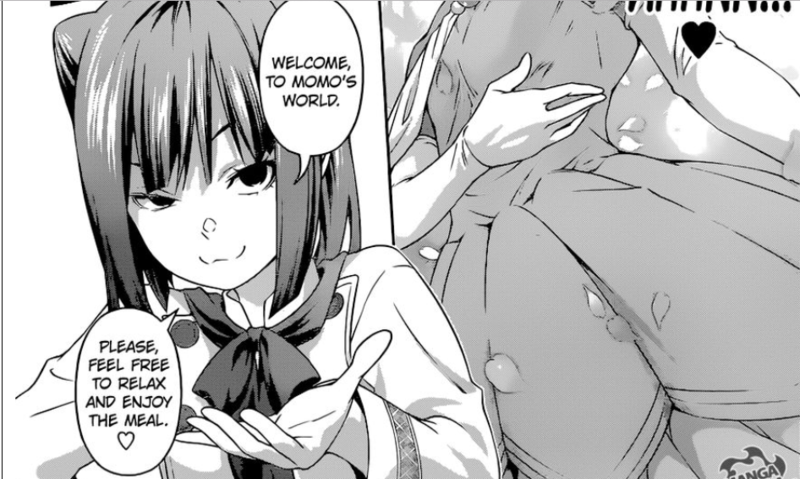 If you are interested in reading news manga series then you can read them here too. Overall you will find almost all manga that you are interested to read in, under the variety of category or by any particular option. So read one piece manga online here or some other popular manga ongoing series, you will get almost each of them here freely available. It’s another manga site, with a huge manga library. You can check out all latest manga releases under the latest releases section from the main menu. Or enter the Manga directory where you get a lot of sub-option for free manga reading such as sorting manga list by Alphabetical manner, by rating, by popularity or by Latest Chapters. If you want to access Manga by the year of their release then you can do it by selecting the from the sidebar area under the manga directory page. Read the chapters of any specific after selecting the manga, some manga pages can ask you for permissions for 18+ age so simply grant the access if you belong to right category. MangaFreak has a huge collection of mangas where you get the daly hot/trend mangas. Here you get a lot of free english mangas which are translated by some good manga fans and contributors who owned the site. One of the best thing about this manga site is that it provides you the advance search by which you can get a very relevant an specific manga result that you are looking for. In this advance search all you need to do is select the manga category under which you want to run the advance search, along with that you can select the series status and hit the search. One of the pretty good sites for English manga online with a good collection. Get the list of Latest manga or Manga Series. You can read your manga by using the menu it provides, or discover new manga to read here. The good part about this site is that if somehow you left the site in between reading then another time if you access this site then you can carry on reading that manga just by simply looking at history section. All you need to do for checking your history, you need to create an account and login so you get the best experience with all the features of this site. In term of manga content this site has everything you want and has almost every category that you wanted or you might try rather than reading manga from the separate/specific category. But this site has even better Advance search than MangaFreak , here you can search and filter manga by series name, author name, artist name, genres, and year of release too. This site not only separated on Manga, you can do the same filter and search for Korean Manhwa. Along with that, you can read spoilers and news on manga. One of the popular manga sites with a huge database of different mangas. Everything is almost same here, search the Kissmanga database for your favorite manga series. You can search by genres such as 4-koma, Action, Adult, Adventure, Comedy, Drama and a lot more others. You can get the list of series name along with their latesr chapter status that current time. The almost similar advance search is here too. 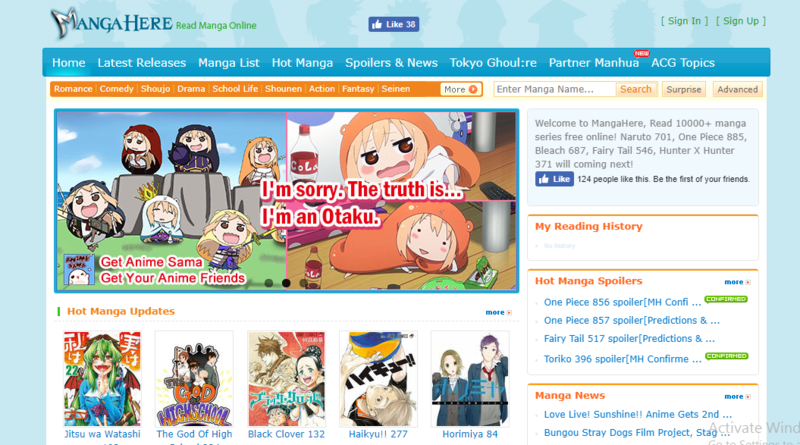 Kissmanga has its forum where you can discuss threads on manga, and to avail this you need to register on this site. This site has very attractive design and gives you the list of latest manga releases. Under each manga, you will get very detailed description of each manga by views on it, author name, alternatives to that manga series, user rating on that and the updation status too. From the main menu, you can choose from category like Latest, Hot, New, Completed Manga. Or you can run a query from search bar from the top of the page. On the right hand side you can see the colorful sidebar of most popular manga. Not much to explain about this site but it has the same features as listed on above sites and you can find out the all types of manga here. Search by author name or by specific category, you will definitely gonna get you anime here. These above listed Manga sites are totally free. To Read manga online you must try these trusted sites as they are around the web for a very long time and keep on updating the manga content for its users. If you find out any of them suits best for you then you can bookmark those for later fast accessing.